Melinda O'Keefe, of Melindesign Jewelry Assembly Studio has discovered an clever new way to market her services and make money doing what she loves...making jewelry. She explains her journey, moving from being a designer and a teacher to becoming an experienced assembler. Unlike those "make crafts at home" scams where you will find that you never get paid for your work (it's never up to their requirements...the whole idea was to sell you the kit in the first place), Melinda has brilliantly figured out how to help other jewelers increase their production in a way that benefits them both. Smart girl! Read her story at Rena Klingenberg's site, Home Jewelry Business Success Tips, and if you haven't already subscribed to it, do it for heaven's sake! The June 2010 issue of Bead & Button has an article by Lisa Keith, teaching a very clever variation on the simple ladder stitch. She shows how it can be used to create twisted bracelets or necklaces. As I read through the instructions and saw how easy they were, I thought I'd point it out for those of you who aren't subscribers and who might like to pick up this issue. This stitch could be used to create a gorgeous neckstrap for an art bead or pendant, using a different stitch from the customary spiral stitch that we all love. Above is a short little sample that I stitched in less than 15 minutes...it works up fast! 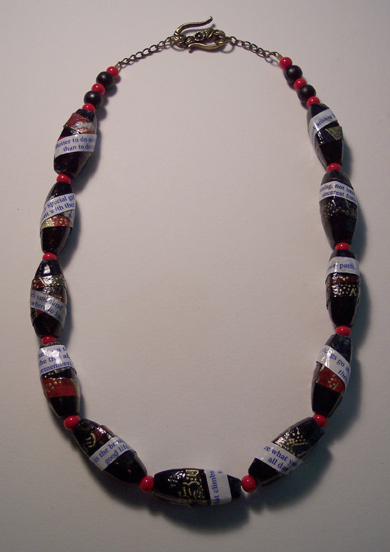 The large central bead in this piece is made from bead-woven silver and copper beads, using a spiraling peyote stitch technique. It is approximately 2-1/2 inches long, and is surrounded by copper, silver, and turquoise in the rest of the necklace strand. The rest is put together using simple stringing and wire work techniques. 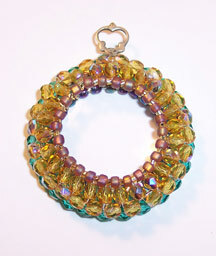 The trick to creating a spiraling strand or bead like this is to use different sizes of beads and to weave tubular peyote using an odd count. As you make your way around the tube, the spiral naturally develops, and it is accentuated by using different sized beads. This is similar to the Cellini spiral, which is worked even count. 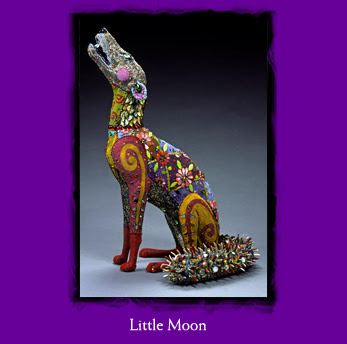 Review of a great book: Candie Cooper's Metalworking 101 for Beaders! Don't miss this! Cherry wood bezels are the stars in this new pendant collection. My friend Tammy Powley , well-known author in the beading world and the guide at the About.com jewelry making site, has started on a brand new venture: producing wonderful jewelry kits. She sent me one to try and to critique for her before its release, and now I can tell you about it! Look at how cute the packaging is, and check out the pretty pair of earrings that I made from the materials and the instructions. Tammy is selling her kits through her Etsy shop, and they are available as a full kit, just the supplies, or just the instructions. 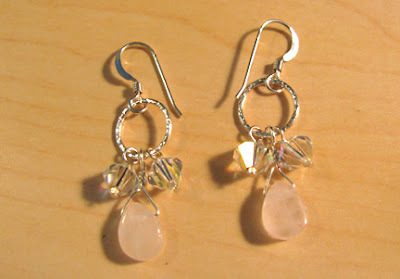 I made the earrings shown above, using the Lovin’ Rose Quartz Briolette Earrings kit. The instructions were very detailed and easy to follow, with excellent photos to accompany each step. There are a few extras in the kit in case this is the first time you've worked with wire...no worries if your first loop doesn't turn out perfect! I would definitely recommend the kits to anyone who would like a nice gift for a beading friend, for anyone who would like to try a new jewelry making skill, or who prefers not to have the work space cluttered up with too many extras. 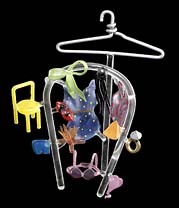 The Luce Foundation Center for American Art has a fabulous jewelry collection. The Luce is one of the less well-known of the Smithsonian Museum family. If you won’t be taking a trip anytime soon to Washington DC, the Luce’s website thoughtfully displays a certain amount of the collection for your viewing pleasure right online! You'll find everything from modern lampwork and fused glass to mixed media assemblage, fabricated metalwork, bead weaving, and historic pieces. This museum is well worth the time for a visit if you can possibly make it. Would you like to have a book that tells you how to do more metalwork than simply making your own jump rings and ear wires? Would you like to learn how to make those correctly, but not stop there? 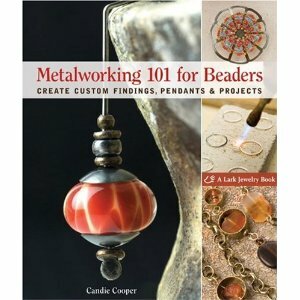 Candie Cooper has written a terrific book, Metalworking 101 for Beaders , and I've got a copy here to give away! Maybe you'd like to make your own bails with gorgeous pierced designs that complement the rest of your necklace (check out "bamboo bail"). Perhaps you've been wanting to learn to make your own ring bands ("profusion ring"). Or maybe soldered rings ("tassel necklace"). Candie starts out with all the technical know-how necessary to make the terrific projects she's included...and there are lots of them, ranging in skill levels so that everyone will find projects to love. Would you like to win a free copy of Candie Cooper's book? Just leave me a comment below and you'll automatically be entered. If you tweet or post on Facebook or other social spots about the contest, you can leave a second comment and be entered twice! Deadline: June 30, 2010. 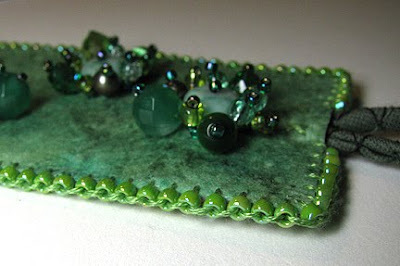 Here is my Bead Journal Project piece for June. The green of spring is starting to shade into the deeper blue-greens of early summer...exactly what happens in New England over the course of the month of June. I started with some faux leather fabric that I made from felt for the background. You probably can't see it really clearly in this shot, but up close it looks and feels just like thin leather, dyed of course! I used a Nevada turquoise cab, heavy on the green tones, that's been sitting around here forever, just waiting for a project. 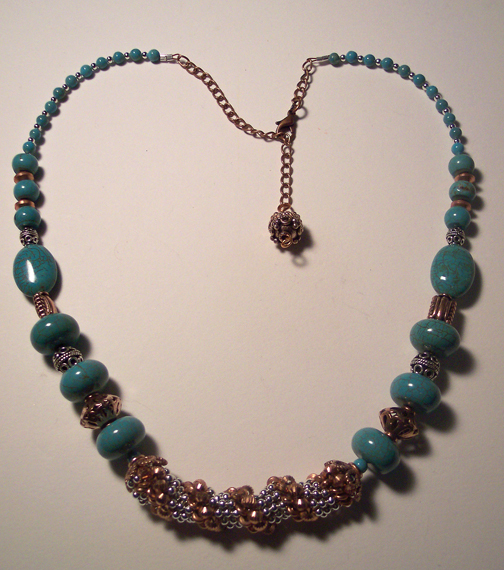 Surrounding it are clusters of beaded stacks built around amazonite rondelles. This bracelet is one of the featured step-by-step projects in Chapter Two of my e-book: Altered Surfaces. Some vintage optical test lenses make great magnifiers, with their thick convex shapes. I chose one such lens to make this bead-rimmed double sided pendant. If you can’t find an optical test lens that suits, a 1-1/2 inch magnifying glass on a loop would work as well. 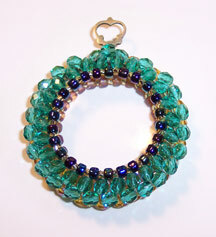 I used right angle weave (RAW), the one-needle variety, to make the beaded rim for this piece. The two sides are constructed separately, and then they are stitched together, which allows you to chose different colors for each side. The pendant shown here has just the basic RAW rim, but if you are experienced with bead weaving, you’ll know that this rim can easily be embellished with layers and layers more beads if you wish to fancy it up! 1. 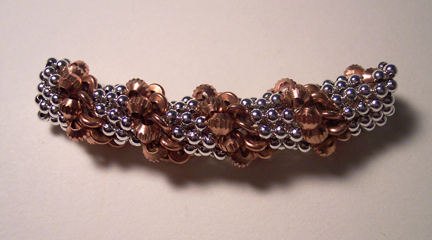 Use a 3’ length of Nymo, single threaded on a beading needle. Needle through 1A, 1B, and 3C. 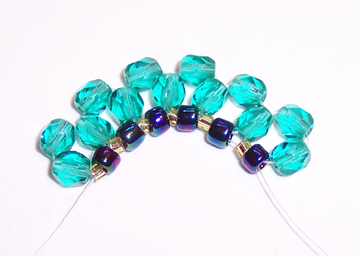 Make a loop and run the thread through all the beads again, leaving a 5” tail. Pass the needle through the A and B a second time. 2. Needle through 1A, 1B, and 2C. Loop around and needle down through the closest C from the previous step. Pass the needle back through the A and B from this step a second time. 3. Repeat step 2 until there are 24 clusters and they are ready to join into a circle. 4. Finish by passing the needle through 1A and 1B. Pass the needle up through the C on the end where you began. Needle through 1C, and then pass the needle down through the closest C in the previous cluster. 5. Pass the needle through the entire ring of As and Bs. Tie off and glue. Work the 5” tail into the beads and clip off, but leave the long tail for later. 6. Make a second ring of RAW clusters, following steps 1-5. 7. Using one of the long tails, needle up through the first 2 Cs to emerge from the top edge of each ring. 8. Weave the thread back and forth through the top edge beads of the two rings, passing the needle alternately through a bead from each ring.. As you get back around close to the beginning, insert the optical lens. Finish weaving back and forth up to the stem of the lens. 9. Circle the stem of the optical lens, running the needle through the top edge beads around the stem. Needle back down to the inner loop, next to the other long tail. Tie them off and glue the knot. Work the ends through a few beads and clip off. A button get's glammed up with tear drop rhinestones. Cindy touts one of her favorite colors in this week's rewind. Lorelei got together for a fun beady date with Kerry Bogert, and together they created a necklace! Come by and visit for a chance to win free Patina-ted Metal Components! 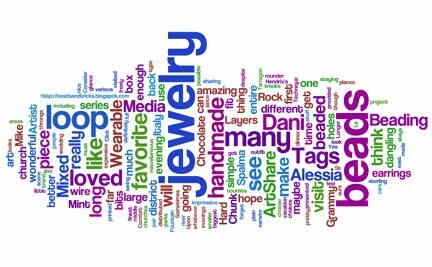 Jean is fascinated by the beautiful necklace which Jennifer Dangerfield created and reposts her analysis of what makes it so appealing! All jewelry afficionados really must see this lovely piece! Melissa shows off her necklace design that won second place in the Metal Clay category of Bead Dreams 2010. On the heels of his trip to Milwaukee for the "Bead & Button" Super Show, Andrew documents and shares his favorite highlights from the experience. What do you think about solar system jewelry? Lisa found a ceramic bead strand that looks like it could turn that solar system science project into jewelry! If you are selling your jewelry on-line or thinking about it, then you'll find some of these resources very helpful. The June Monthly Challenge is a painting by Toulouse-Lautrec. Do you like Chinese food? Do you like jewelry...? 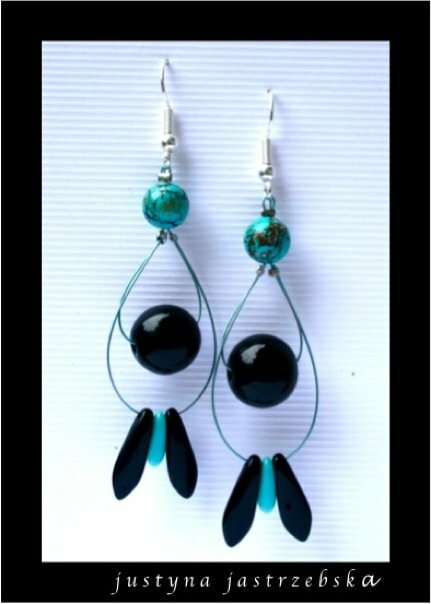 Justyna Jastrzebska has created a blog called JewelryClassroom, where she shows you many of her unique a gorgeous techniques for making stunning jewelry! You definitely are going to want to visit her and see all that she’s up to! 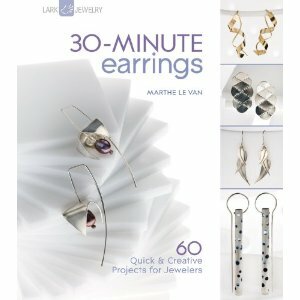 Here is a link to one of her jewelry making videos to get you started. If I could pick one word to describe my most burning passion, it would be individuality. Growing up in Poland played a monumental role in this. Poland in the 80’s – yes, you can try guessing my age – was all about conformity. You’d find more or less the same goods in every shop. Everyone looked the same. Everyone acted the same. In fact in the town I grew up in, any attempt at making yourself stand out from the crowd was met with mockery and disapproving looks. Don’t get me wrong here, I’m not trying to bash my homeland. I love the people, culture, food and environment I grew up in, yet I always found myself wanting something more. I wanted to find myself. Not the person people expected me to be, but the person I was meant to be. I wanted to live my way, express myself my way, and carve my own mark on the world. So as soon as I finished my marketing studies in Poland, I set out to experience life in different European countries. It was a huge eye-opener to me. I furthered my studies and worked in the Czech Republic, Scotland, England and Ireland – all of which were the polar opposite of Poland. I met fascinating people from dozens of different countries, each with their own sense of style, philosophy and individuality. It was during this time that my passion for art flourished. I had always been a creatively inclined person, learning to paint, draw and dance barely after I had learned to walk–but my experience with all these lush cultures and people led to a deep interest in impressionist art, exotic dancing, and yes, you guessed it, jewelry making. By far, jewelry making was (and still is) my greatest passion. I make it a point to get to know the culture and tradition of every country I visit to use as inspiration for my jewelry designs. I spend hours at every art gallery in every town I step foot in, looking for clues for my next masterpiece. I seek out local jewelry makers, and soak up every ounce of wisdom they’re willing to share. I am completely and utterly in love with the vast possibilities offered by jewelry making. The countless ways in which you can express yourself, challenge your creativity and find yourself in the process – all this has fulfilled my desire to be different, to be unique, to stand out from the crowd. I haven’t stopped traveling. I’m now living in Malaysia, soaking up as much Southeast Asian inspiration as possible before I jet off on my next adventure. And thanks to this website, no matter where I am in the world, I’ll still be able to show you – and as many others as possible – one of the most rewarding ways I know of to unleash the creativity, uniqueness and individuality that lies within each and every one of us. Don't we just love charts around here? Well, the fabulous Sara Hardin has posted two charts that you will most definitely want to see. The first is a Beading Wire Comparison Chart, which lists all the variations of SoftFlex along with diameter, number of strands, test strength, best uses, and crimp size needed. There's a second chart which tells you how many strands of wire at each diameter can pass through a bead of a given size. 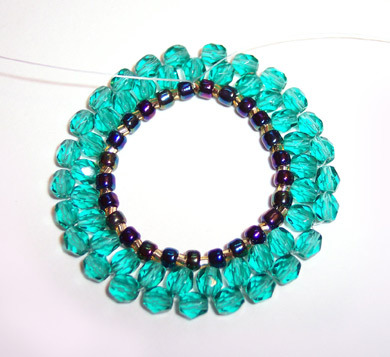 For example, the medium diameter wire ( 0.019") will fit four times through a size 8/0 seed bead. Sometimes you really need to know these things before you start creating your design. See the Seed Beads vs Beading Wire Diameters Chart for this info. Here’s a good excuse to eat more Chinese food! The instructions that follow will create a 20 inch necklace, but you can adjust it to your favorite length by either changing the number of beads, or altering the length of chain used. 1. Cut thin strips of decorative Asian paper and trim down the fortunes close to the printing. 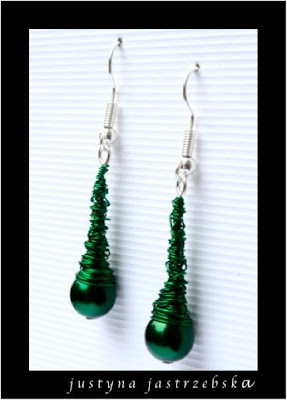 Hang your large oval beads on a wire and suspend them so that you can brush glue all around them. 2. 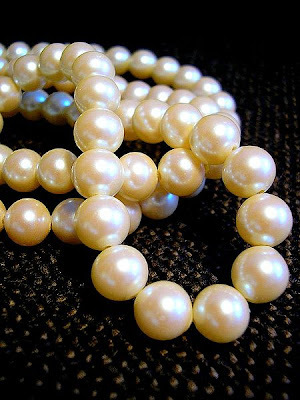 Brush on a thin coating of Diamond Glaze and wrap the decorative strip around the bead, smoothing it into place. 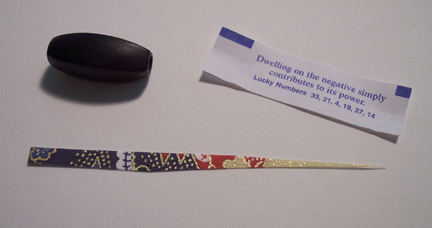 Brush some adhesive on the fortune, and wrap it over top of the paper strip. 3. Let the beads dry, and brush on another coat of Diamond Glaze. Add a third coat to seal in the papers well. 4. Cut a 24 inch piece of beading wire and string on your beads, alternating the decorative ovals with small round red beads. 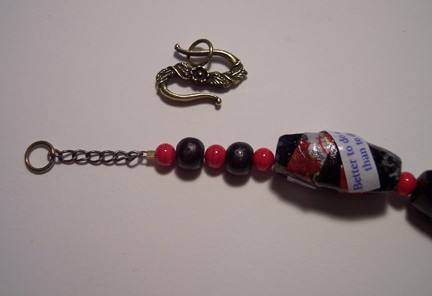 Alternate a few round red and black beads at each end to equal approximately a 17 inch strand. 5. Cut two pieces of chain to 1 inch each. Attach the beading wire ends to the pieces of chain by using crimps. Bury the wire ends in the round beads and clip the ends close. 6. Add one of the rings that come with the S hook to each chain end. Slide on the S hook, and tighten down one of the arms around one of the rings. I've noticed several articles, both in print and online, that have been bashing the so-called celebrity designers. I'm not talking about designs that arise from famous fashion houses, but entire lines that some celebrity has "created" for (Walmart, Target, KMart, fill in the blank). Whether they are supposedly creating perfume, fashion, or jewelry, do any of us really truly believe that they are doing much more than lending their names to a line? At best, perhaps, they really do like the pieces that wear their names. At worst...well, let's not even go there. I don't know whether it bothers you or not to see celebrity jewelry "designers" cropping up all over the place. I can tell you that Abe Gurko is definitely bothered. He calls them the "tabloid sweeties" who are here to muck things up! Great line, wish I'd thought of it. "...do you think Alicia Keys, between amazing albums and looking stunning, took a silversmith class and hammers every little piece by hand when she is not practicing the piano?" No Abe, I'm with you...I think not. Rod Stafford Hagwood is equally witty and cutting: "One of the more disturbing things to come about this decade (and this century) has got to be how anyone - and I mean anyone - can call themselves a "designer" without even knowing how to sew on a button on or sketch a stick man. Masseurs have more oversight. Nail technicians have more training. All you seem to need these days is fame....and not a great deal of that either." Rod is hysterical...you need to read his entire piece. What to do about it? Absolutely nothing! 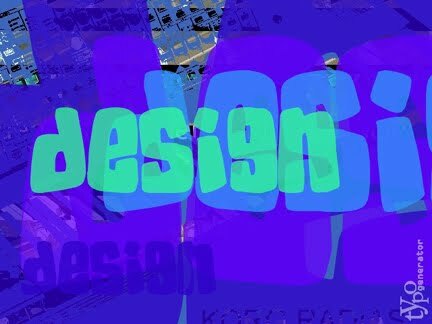 Just be amused, practice your skills, and wear the title "designer" with pride. Join the Art Bead Scene Carnival Bloggers as they pay tribute to Bead and Button by creating a statement necklace. Look at all the fun I have have playing with fire. Carmi recycles a beautiful tea box to create this necklace. The Empress models a statement. Check out Black Crow's Gothic Contest winners...fantastic! Lorelei started up a new website, and would love to hear your input on it! 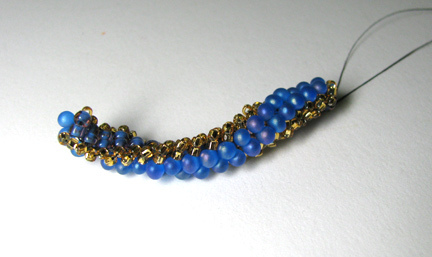 Lydia Muell's mesmerizing art beads and her free giveaway this week! Andrew hosts the BIGGEST prize in Thursday Giveaway history ever! Find out how you can win a set of beautiful lampwork glass beads by Barbara "Basha"! Do you have crafting or beading get togethers with friends and family? Lisa shares the anticipation of "Craft Night"! Tammy is proud to announce some of her jewelry designs were recently published in BeadStyle magazine. Heroilda of Las Creaciones de Boricua is the winner of Crystal Brilliance ! Congratulations to you!! Do you love Jamie Cloud Eakin's work as much as I do? Then hop on over to Lark Crafts to read an interview with Jamie and find a link to a free bonus project! 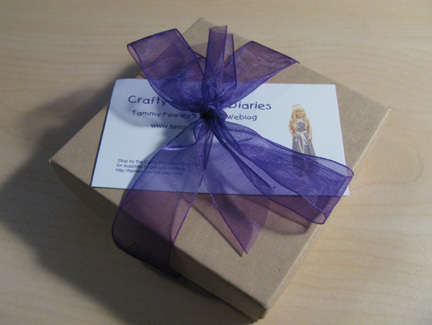 You'll also find an interview with jeweler Joanna Gollberg, and a chance to win fabulous Lark books! There’s a lot to love on Betsy Youngquist’s site! 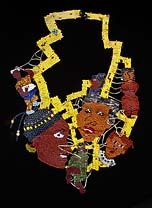 I really love her older beaded paintings, but it’s her beaded objects like the ones below that totally blow me away! 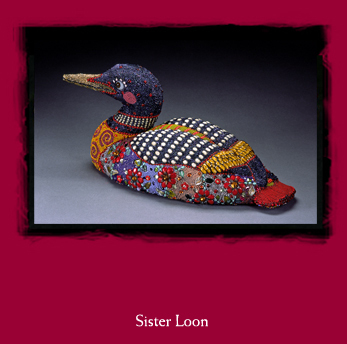 Not surprisingly, Betsy’s work has been featured in many books and beadwork magazines. Most of her very newest work features doll heads. She is an artist who is always growing, changing, and pushing herself to raise the bar! And talk about prolific! My goodness. Kate McKinnon is a master of form and a delight to read. 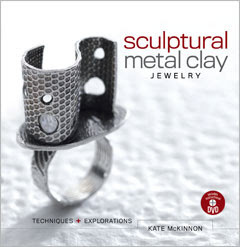 Her new book, Sculptural Metal Clay , even comes with a DVD so that you can have Kate guide you through her amazing techniques almost as if she were right there with you! This book begins with an overview of the properties of metal clay and the basic techniques which will be used in her projects. All of the basics are shown in great detail so you will have a great foundation once you've worked your way through this section. The projects include wonderful sculptural rings, pendants and chains. I'd say the overall feel of the book is aimed at the advanced beginner through intermediates, but a determined beginner will find a lot to like here too. Always on top of safety issues, Kate points out that fine silver has fewer toxic qualities than sterling silver in just about every stage of working with it. Still, there are important safety concerns that she covers because she wants us all to live long long lives of creativity. Many times I find myself saying "yeah, yeah" when it comes to these issues, but Kate weaves them throughout her text in a way that really got me to consider my own practices. If you sell your jewelry online, hopefully you know that good traffic flow is a must. Let me repeat that: Good. Traffic Flow. A Must. If you don't have Good traffic flow, you will not have sales. What constitutes good traffic flow? Visits by people who are looking to buy what you're selling. Not visits by other artists who are looking for ideas or bored trolls who are looking for places to leave nasty comments. So what are you selling? Specifically, what are you selling? Are you selling simple inexpensive pendants for teens? Upscale precious metal pieces with set stones? Are you perhaps selling lessons and patterns instead of finished pieces? Or maybe you are selling supplies, like your own lampworked glass beads for other artists to use in their designs. You need to be very clear about exactly what you are selling and what your best market is before you spend a lot of time (or any amount of money!) targeting those people. After you figure out what your specific niche is, here is a brilliant post by Darren Rowse of Problogger that you should read on some different approaches to generating traffic to your blog. Darren has lots of other good information on traffic generation, and you can find a selection of those posts linked at the bottom of the article above.